The Mercury Bay area of the Coromandel Peninsula is an area of stunning beaches and bays. Azure blue waters roll onto clean white sands, while bush clad hills shelter the bays and further enhance the scenic splendour of the area. Mercury Bay is a very popular holiday destination and during the summer months the population swells considerably. For the rest of the year a relaxed, away from it all, atmosphere prevails. Whitianga is the main settlement of Mercury Bay, an attractive township with a deepwater harbour. The wharf in the centre of town is the departure point for fishing enthusiasts, charter boats and scenic cruising. If taking your own craft, Mercury Bay has several launching ramps. An enjoyable excursion for young and old is the ferry crossing across the river to Ferry Landing. Passengers alight at the oldest stone wharf in Australasia. A short walk up the hill from the ferry leads to Front Beach then on to Flaxmill Bay. You can hire a scooter and explore further to Cooks Beach and beyond. Marine reserves are set aside for the regeneration of the marine environment and this particular area was chosen for the quality, complexity and diversity of its habitats. ' The reserve is named Te Whanganui-A-Hei after a Maori Chief who arrived on the Te Arawa waka (canoe) at the time of the Polynesian migration to New Zealand in the 1300s. Taking of fish and shell fish in the reserve is prohibited. For golfers there is an 18-hole golf course 3.2km south of Whitianga, a 9-hole course at Purangi near Cooks Beach, and an 18-hole course at Matarangi, 26km north of Whitianga. A short distance north of Whitianga is Wharekaho Beach where there is a fine stand of Pohutukawa trees. One of these is a gnarled old specimen that exactly fits a description in the journal of explorer Captain Cook written in 1769. A further 18km north over a scenic winding sealed road is Kuaotunu, gateway to the pristine beaches of Otama and Opito. These beaches are worth the journey but are accessed only by travelling over a steep, winding, narrow, unsealed road. As you travel towards Coromandel you may visit the white, sandy beaches of Matarangi and Whangapoua. The warm climate and rich soils of the Coromandel promote lush growth and this is shown in the native bush that covers much of the Peninsula. Huge majestic trees, including Kauri that survived the intense milling of last century, have been protected and can be seen by the highways and walking tracks. The famous Tahitian explorer and master mariner, Kupe, with a group of his people, set foot in Whitianga approx. 950 AD. Kupe landed at Whitianga which he named TE WHITIANGA-a- KUPE - the crossing place of Kupe. Kupe left some of his people here to settle and he carried on with his journey. Toi-te-Huatahi arrived further south about 1100 AD where his descendants quickly flourished and spread north to eventually dominate the Whitianga area. Hei arrived with the last great migration in about 1350 AD. He was a sailing master on the canoe Te Arawa. He eventually settled in the Hahei area, naming the area after their tribe building the prominent headland Pa Hereheretaura. He named the Bay Te Whanganui-a-Hei, meaning the great bay of Hei. Hei s descendants intermarried with those of Toi, eventually dominating the area from Whangapoua to Whangamata. Captain James Cook, master seaman, surveyor and astronomer, sailed on the Endeavour into Mercury Bay on 3rd November 1769. Cook anchored at Cooks Beach off Purangi. He spent several days in the area exploring and taking astronomical readings and while here he observed the transit of Mercury. There are two monuments commemorating this event: one at Cooks Beach, and the other at Shakespeare Cliff. Cooks explorations were the starting point for what was to become a vibrant Kauri timber industry. The potential of the Whitianga area became recognised in the 1830s when Gordon Browne purchased land for Mr Ranulph Dacre, a prominent merchant of Flaxmill Bay and Cooks Beach, establishing the first European settlement in the area. 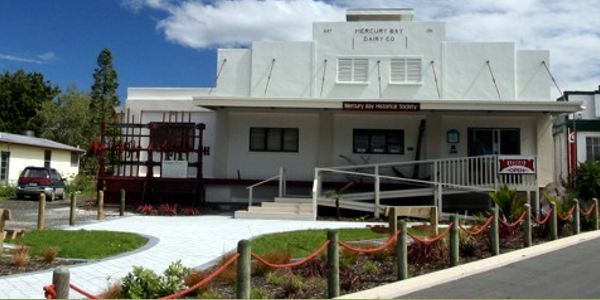 Mercury Bay has a rich and interesting history, full of Maori and European settlers arriving, flax milling, collecting & trading Kauri gum, gold mining and ship building. You can learn much more of the local history by visiting our museum.